Nothing compares to a Wyoming road trip. The Rocky Mountains and the High Plains meet right here in Wyoming, resulting in stunning views in every direction. Wyoming has over 20 scenic byways that twist, turn and climb through some of the state's most breathtaking landscapes. Plan a drive along these Wyoming roads to immerse yourself in wild beauty and western history. This 57-mile paved highway follows Wyoming Highway 70 through Medicine Bow National Forest and over the Sierra Madre Mountain Range. Starting in Encampment, Wyoming, Battle Pass Scenic Byway drives through a number of ghost towns and passes the field known for the famous 1841 battle between fur trappers and Native Americans. Located just east of Yellowstone National Park in Wyoming’s northwest corner, Beartooth Scenic Highway follows US-212 as it winds through Shoshone National Forest. Nearly 39 miles of this 68-mile drive are in Wyoming, with sections crossing into Montana. Plan to spend about three hours driving this beautiful road, and leave plenty of time for stops at numerous trailheads and lookout points along the way. This scenic byway begins in Shell, Wyoming, and travels along US-14 for 58 miles before connecting with Medicine Wheel Passage, which is located just southwest of Dayton, Wyoming. Bighorn Scenic Byway passes through Bighorn National Forest, past Shell Falls and over Granite Pass, featuring views of vast ranchlands, limestone outcroppings and various mountain peaks along the way. Be sure to make time for stops at scenic overlooks, trails and other enjoyable outdoor areas. Traveling 68 miles from Kemmerer, Wyoming, to Cokeville, Wyoming, this scenic backway offers mountains, valleys wildlife-viewing and more. Big Spring Scenic Backway follows Wyoming Highway 232 as it passes through the same part of the state over 350,000 emigrants passed through along the Oregon, Mormon and California trails. If you travel to this part of the state, add Fossil Butte National Monument near Kemmerer to your list of places to explore. Located in northeast Wyoming, this scenic drive travels through the large Black Hills region that spills into South Dakota. The byway begins in Newcastle, Wyoming, and continues for 78 miles toward the South Dakota border, offering a glimpse at the region’s complex geology. Discover the lesser-known Black Hills of Wyoming by stopping to hike, mountain bike, fish or just get outdoors along the way. You can also explore ghost towns and museums as part of your Black Hills Scenic Byway experience. This historic byway was once the point where the Oregon Trail, Mormon Trail, Pony Express Route, Transcontinental Railroad, Old Lincoln Highway and old US-30 all met. You can find this route in Wyoming’s southwest corner as an offshoot of I-80. While the road only spans 20 miles before reconnecting with the interstate, it passes through a number of historic sites, including Fort Bridger State Historic Site. Plan to spend a few hours immersed in this significant part of western culture. Winding west toward Yellowstone through Shoshone National Forest, Buffalo Bill Cody Scenic Byway is filled with wildlife and stunning views. This drive starts about 25 miles west of Cody, Wyoming, and follows US Highway 14-16-20 for 27 miles. Take time to enjoy a hike or a stay at a historic lodge before experiencing this route’s ultimate grand finale: Yellowstone National Park. The byway ends near the park’s east entrance, which is usually open May through October. Located in northwest Wyoming, this scenic drive begins near Yellowstone National Park's eastern border and travels southwest through Shoshone National Forest and the Absaroka Mountains. The 47-mile drive along Wyoming Highway 296 boasts prime wildlife viewing and outdoor recreation opportunities to those who stop along the way. Chief Joseph Scenic Byway was named after the chief of the Nez Perce Tribe, as the region was home to this Native American group before they left in an attempt to flee the U.S. Cavalry. Cloud Peak Skyway is an incredible stretch of road that offers views of the Big Horn Mountains, including the highest peak in the range, Cloud Peak. The scenic drive follows US-16 between Ten Sleep and Buffalo in north-central Wyoming. In just 47 miles, the Cloud Peak Scenic Byway transports you through Ten Sleep Canyon and Bighorn National Forest before climbing to stunning views of the Cloud Peak Wilderness. The Flaming Gorge-Green River Basin Scenic Byway connects two roads split by the Green River in southwest Wyoming, traveling through high desert and towering rock formations along the way. Wyoming Highway 530 and US-191, both located just west of Rock Springs, use I-80 as a connecting point to create the 160-mile byway. Both roads travel to the Wyoming-Utah border, with US-191 continuing through Utah and into Arizona. Plan to stop and enjoy the recreation opportunities surrounding both Green River and the breathtaking Flaming Gorge National Recreation Area. Located in north-central Wyoming, the Medicine Wheel Passage travels along Wyoming Highway 14-A, offering views of the Big Horn Basin and Absoraka Mountains. This scenic drive passes Wyoming’s Medicine Wheel Historic Landmark and celebrates the state’s rich Native American history along the way. Those traveling west along the byway can connect the 27-mile drive with Bighorn Scenic Byway to extend their route. 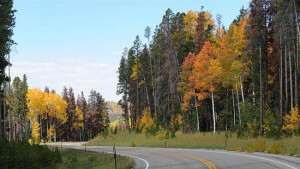 Mirror Lake Scenic Byway begins in the southwest Wyoming town of Evanston and travels south along Wyoming Highway 150. The byway crosses into Utah, winding through the Uinta-Wasatch-Cache National Forest before ending in Kamas. Travelers can take in views of the beautiful Uinta Mountains along the drive’s Wyoming segment, which extends for 20 miles before crossing into Utah. Muddy Creek Historic Backway takes travelers through the famous Muddy Creek, a popular spot for those traveling along the Oregon, California and Mormon Trails to stop and set up camp. The area also acted as a stopping point for the Pony Express and later became a water stop for the Transcontinental Railroad. The 25-mile backway starts in Fort Bridger and follows several connecting Wyoming highways through the ghost towns of this historic region. Experience America’s westward migration firsthand on this 57-mile drive through the same region Oregon Trail travelers journeyed over 100 years ago. The Oregon Trail Historic Byway begins east of Guernsey in southeast Wyoming and follows US-26 to the Wyoming-Nebraska border. Stop along the way to see preserved wagon ruts and explore Fort Laramie National Historic Site. Located in north-central Wyoming, this byway takes travelers back to prehistoric times. Follow Red Gulch Road off of US-14 to find sandstone cliffs, petroglyph murals and preserved dinosaur tracks. Travelers will also enjoy sites of the Big Horn Mountains and unique rock formations. This drive travels along 32 miles of unpaved road, so plan for about a two hour drive. The 64-mile Seminoe to Alcova Scenic Backway in south-central Wyoming starts in Sinclair and travels north to Alcova, weaving through prairie, desert and climbing the Seminoe Mountains along the way. Bring a fishing rod and bathing suit, as this road passes several reservoirs, including Pathfinder Reservoir, Seminoe Reservoir and Alcova Reservoir. Wyoming Highway 130, better known as the Snowy Range Road, was the second National Forest Scenic Byway in the United States. The Snowy Range Scenic Byway travels along this road in southeast Wyoming, featuring views of Colorado mountain ranges and Wyoming’s towering Medicine Bowe Peak. This byway offers camping and hiking opportunities in addition to scenic pullouts for travelers to enjoy along the way. Located in central Wyoming, this scenic drive travels through old, pioneer livestock trails still used by ranchers today. The 101-mile South Big Horn/Red Wall Scenic Backway passes iconic sites such as Hole-in-the-Wall and passes access roads to other must-visit areas such Hell’s Half Acre and the Seminoe to Alcova Back Country Byway. This 80-mile drive follows US-89 east from the Idaho border into Wyoming's west-central region before heading north toward Grand Teton National Park. Star Valley Scenic Byway climbs Salt Canyon to Salt River Pass and then decends into Star Valley, offering beautiful views along the way. The Wind River Canyon Scenic Byway travels 34 miles along US-20 between Thermopolis and Shoshoni. The drive follows a path through Wind River Canyon that was once used by Native Americans and pioneers before continuing through the Wind River Indian Reservation. Travelers can enjoy fishing or rafting along the Wind River before ending the trip with a hot springs soak at Hot Springs State Park in Thermopolis. The 163-mile Wyoming Centennial Scenic Byway travels from Pinedale to Dubois along US Highways 191 and 26, giving travelers the opportunity to stop at Grand Teton National Park and Yellowstone National Park along the same route. This stunning drive features views rugged mountains and alpine forests as it crosses the Continental Divide and winds through Shoshone and Bridger-Teton national forests. Stop to camp and hike along the way, or take a break in Jackson Hole for one-of-a-kind dining and lodging experiences. Explore the Official Wyoming Travel Guide to see all our state has to offer.